OTTAWA (CIS) – Canadian Interuniversity Sport announced Wednesday Laval University as host of the Speedo CIS swimming championships in 2016. 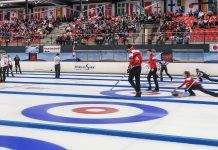 The three-day competition, which will take place from February 25 to 27, has been held in Quebec City on four occasions in the past, including in 2006, 1995, 1986 and 1980. A swimming powerhouse for decades, Laval recently opened a brand new Olympic size pool on its campus. This year’s Speedo CIS championships are set for Feb. 19-21 at the University of Victoria.